Probably one of the most asked questions is "How do I post photos?". Here is a quick guide that should get you started in minutes. 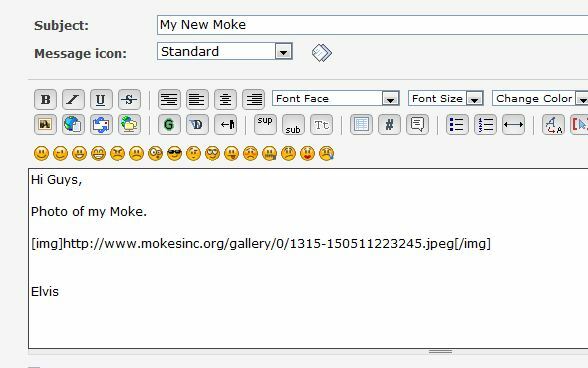 The Mokes Inc. Forum has it's own gallery, so there is no need for third party hosting like photobucket etc. 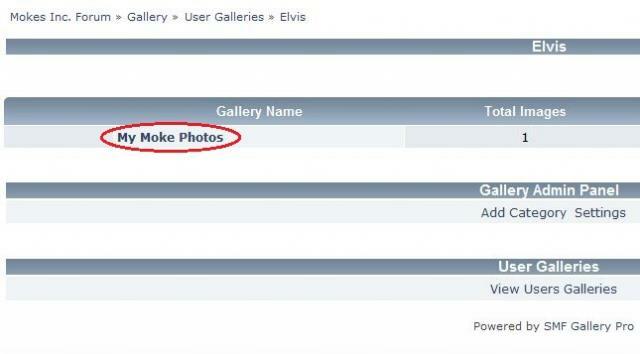 Each member has their own section in the gallery, which we would encourage you to use. There are just three main steps involved to getting your photos in a post. Photos that are larger than 640x800 will be automatically resized and compressed, making it even easier. 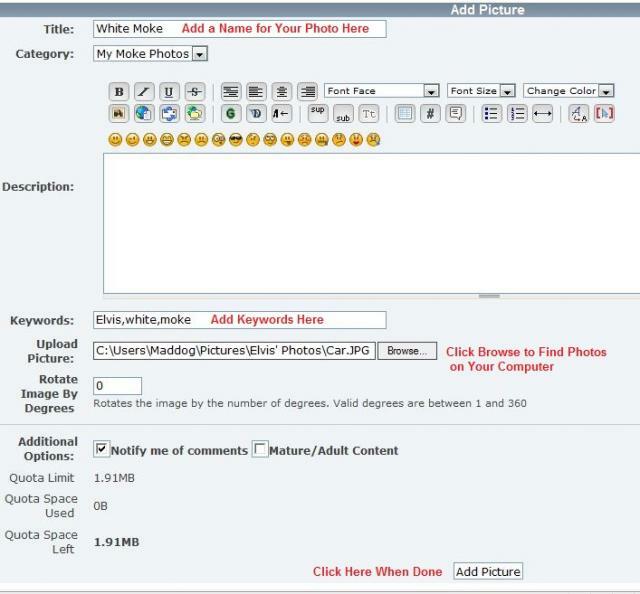 Before you can upload photos, you need to create at least one category to put them in. This is done in your gallery, and you can do it yourself. Click on the Gallery button at the top under your sign in. When the gallery opens, look for the button My Gallery and click it. This is your section where your photos are stored. 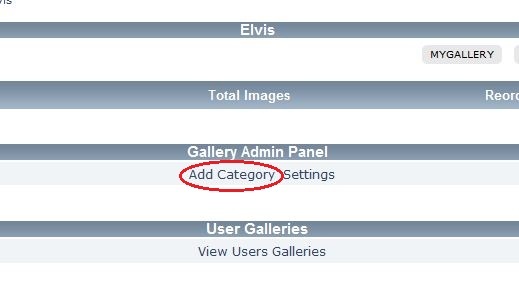 You can create as many categories as you like to sort your photos, but you at least need one. Look down the bottom for the Add Category button and click it. This will open a screen where you can name your gategory. When done click Add Category. You will now be returned to My Gallery, and should see the category you just created. 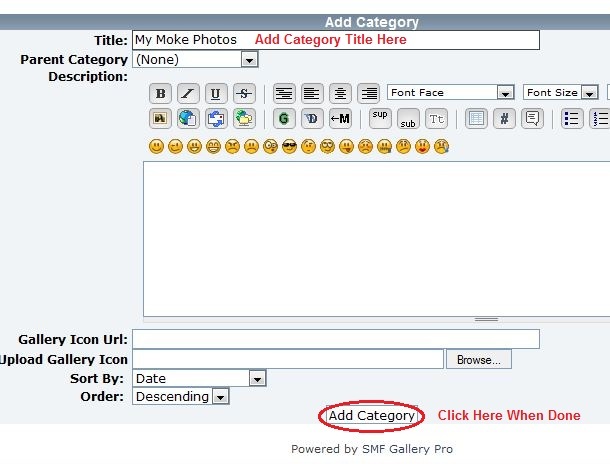 You only need to do this once, but can repeat this step to create more categories and sort your photos. Click on My Gallery and then on the name or icon of your new category to open it. In the screen that opens near the bottom will be an Add a Picture button. Clicking this will open a box were you can name your photo. You must also add some keywords. 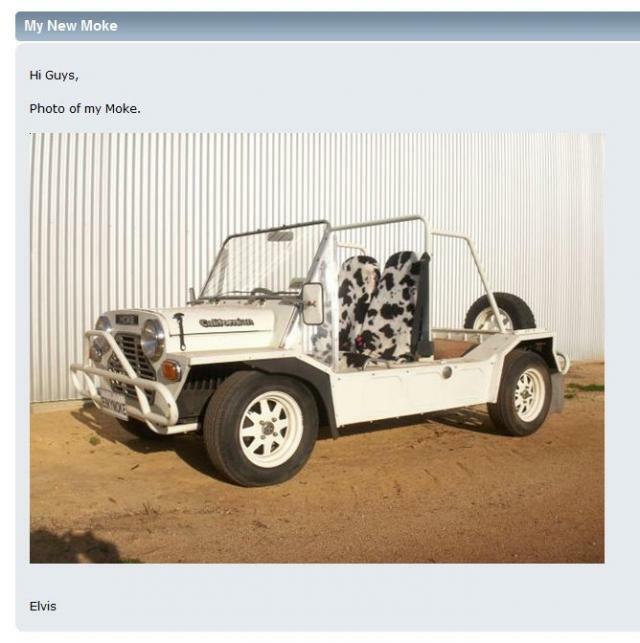 Click the browse button to find the photo you want on your computer, and either select it and click Open, or just double click the photo. When you are finished, click Add Picture. 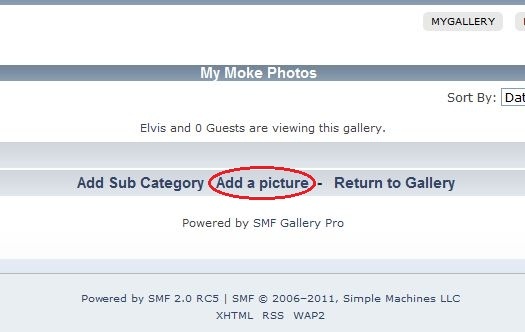 Your photo will be automatically resized if necessary and added to your gallery. This is usually easier if you open two tabs - one for your post and the other for your gallery. When you get to the place in your post where you want the photo, open the gallery in the other tab and then click My Gallery. Click on the category where you saved the photo you want. This will show thumbnails of all the photos in this category. Click on the one you want, and it will open full size with lots of boxes underneath. The one you are interested in is called BB code. You need to copy the entire contents of this box to your post. It can be hard to select as some parts may be hiding, so it's usually easier to right click in the box, and click select all. Then right click in the box again and select copy. 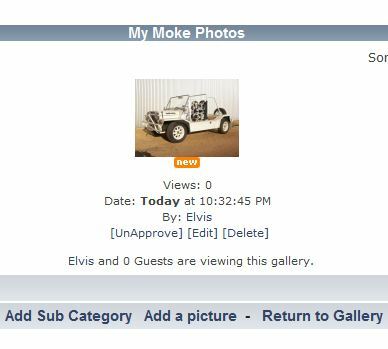 Now change tabs to your post, position the curser where you want the picture, right click and select paste (or ctrl V). Click the preview button to make sure it's right. 5 - Then at the top click on "edit"
For most people your photos will be resized automatically, so if you want to simplify things you can just upload them as is. However, you may get a higher quality image if you resize them yourself, using AC's method or any other you prefer. Maximum width is 640 pixels and maximum height is 800 pixels. Most photos are in landscape format, so maximum size will be 640 x 480 pixels. Images must also be less than 150k. There is no limit to the number of photos you can upload, but there is a size limit to your gallery of 10 mb. So the smaller they are, the more you will fit in. Photos can still look good at 50k or less and load much faster, but even at the maximum size you should have plenty of room.